My buddy Eric and I decided to check out Union one day after work because we had heard it's a funky cool spot with some interesting food. I'd agree on all fronts with varying degrees of success. It's an interesting concept with interesting food, but sometimes "interesting" doesn't translate into well executed food at reasonable prices. You can't help but notice the cool graffiti art on the walls, the second story level overlooking the main floor or the class enclosed robata grill in the middle of the space erupting in flames every few minutes. Then there's the menu - self described as featuring a broad range of Kushiyaki (grilled meat, seafood and vegetables on a skewer) and a variety of sushi and sashimi. What could be better than having tasty sushi with some traditional starters/salads mixed with some grilled meat on a stick? The problem is that our flavors came in waves of really nice with really bland, and on top of that they came at steep prices. 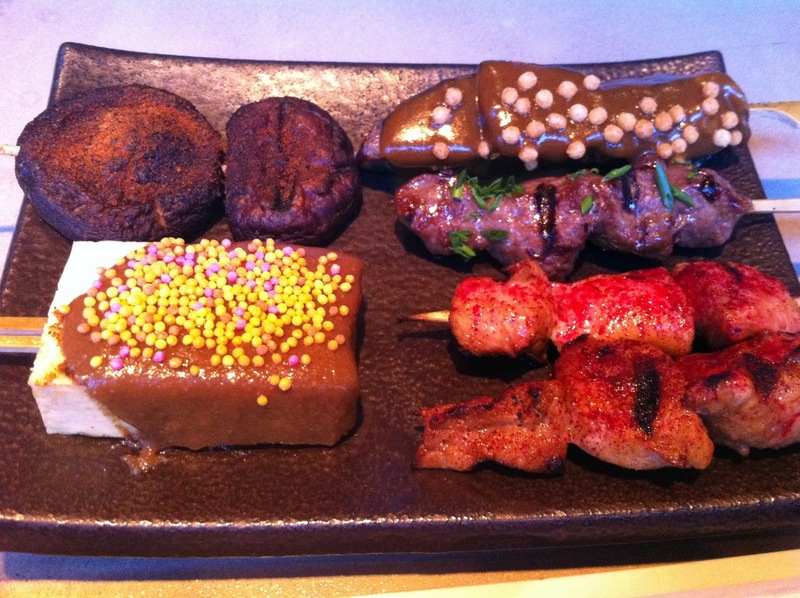 Our first stab at the menu included six skewers of food, two sushi rolls and a Wagyu tartare. There was plenty of roller coaster flavors in that trio. The good: we loved the alligator on a stick, really juicy and tender white meat, the beef filet and tongue - nice and flavorful - and one of our sushi rolls was interesting and simple with a kick of spice without mayo or wasabi. The bad: our $12 wagyu tartare was quite awful - no flavor whatsoever, similar to cardboard. Put it on the salt chip and there's some flavor, add soy sauce and it's manageable. 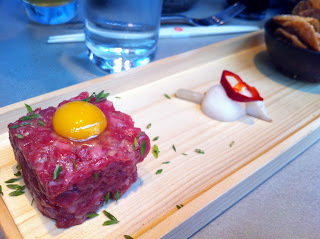 But I wasn't expecting wagyu tartare to be that bland. 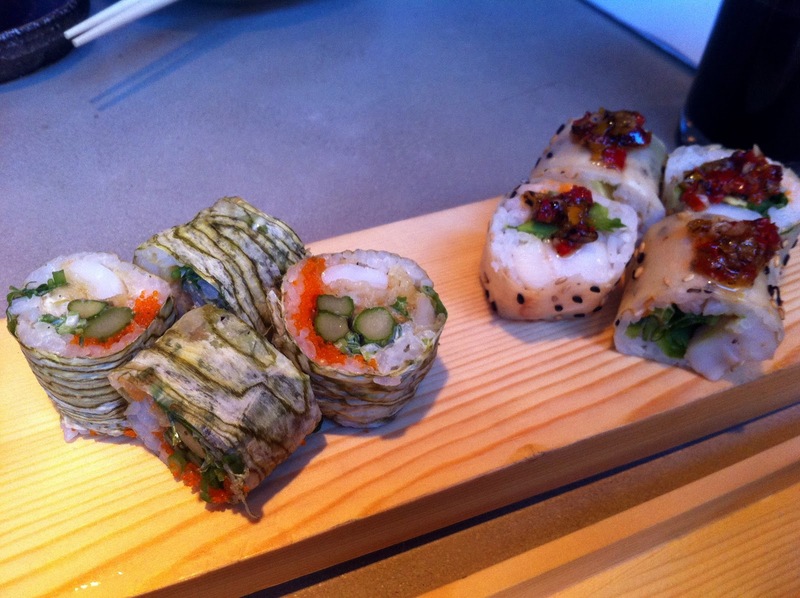 The other sushi roll was ok, not a lot going on but interesting. Biggest problem is paying $6 for only 4 pieces. We also had one tofu on a stick and a shiitake mushroom. My tofu looked like a candy bar with the peanut(?) sauce and sugar color. The tofu was ok but the sauce was way too strong. Eric said he enjoyed the mushroom. Even though it seems like we ordered a lot food, it didn't go a long way. We quickly added to our meal with a chicken thigh from the grill and another beef filet. 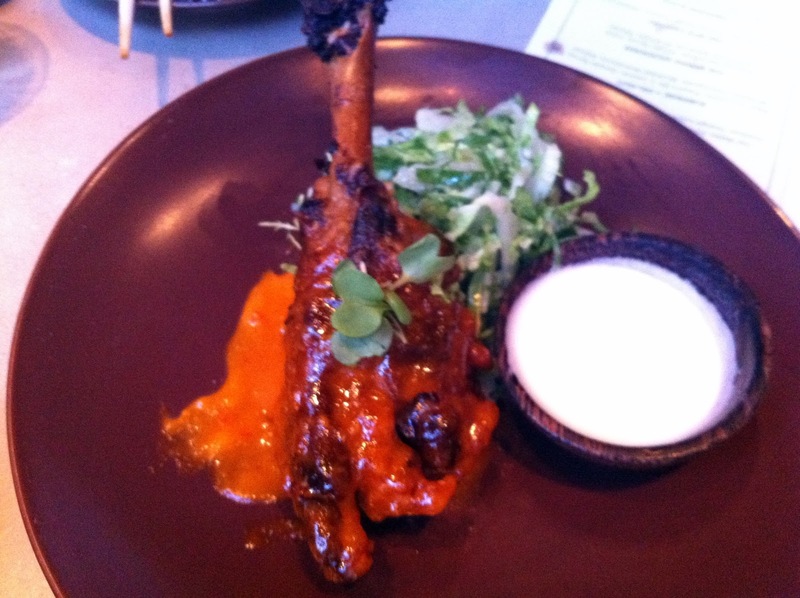 In addition we tried the duck soba noodle dish and a duck wing in buffalo sauce. 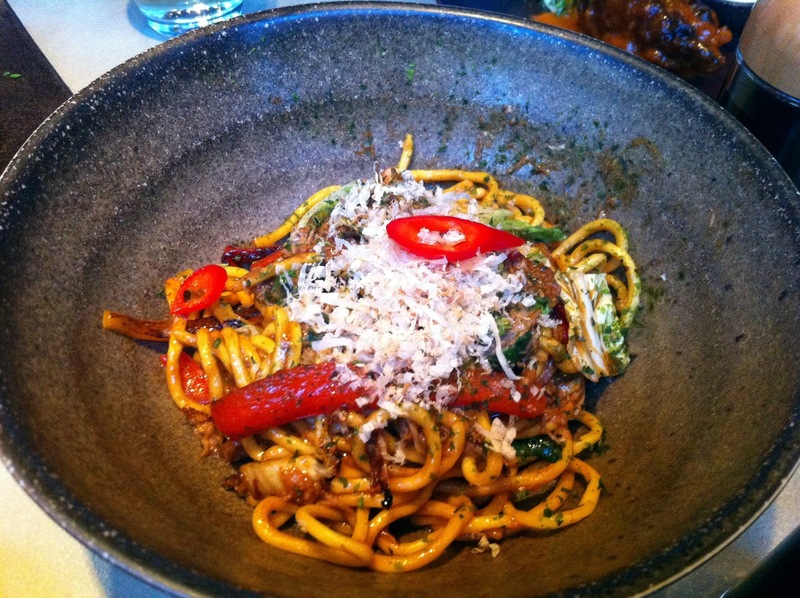 I really liked the noodle dish with shredded duck pieces. It had enough flavor to make it curious but not too many moving parts to get confused. The duck wing in buffalo spicy sauce was also very nice. It's more interesting than ordering chicken wings and probably a little tastier given the size and nature of the meat. And for $5 it clearly was the best value of the night. To finish things off the right way we ordered the ice cream sandwich flight. Cute huh! The star was clearly the chocolate chip cookie with vanilla ice cream. That was delicious. 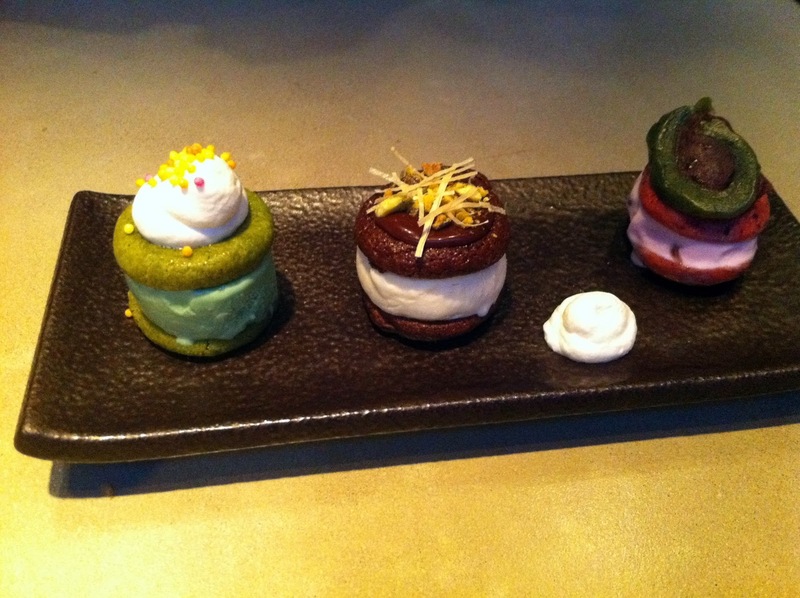 The green tea and red bean are interesting but pale in comparison to the traditional. Union has some good things going for it with some nice dishes and a funky fun atmosphere/decor. The drinks selection is impressive with plenty of sake and imported beer to choose from. My largest complaint is the value for flavor is just not there. Our bill for two was $180 all in (including a few drinks) and we didn't exactly leave stuffed or inebriated. I really like the soba noodles and some of the classic kushiyaki-style grilled meat (must try alligator and beef filet). I wish the sushi menu was more approachable and affordable because that could be a nice meal to mix and match sushi with BBQ (it's in the name I suppose...).